My Uncle Joe makes terrific breakfast burritos, which he wraps in foil to keep warm. On crowded weekend mornings, the pile of burritos shrinks with each waking person. 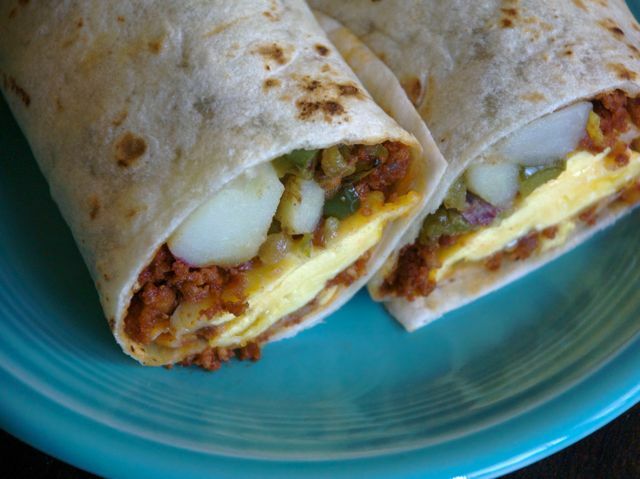 Consider the following recipe a blueprint for breakfast burritos, but by all means adapt it to your own taste and the contents of your larder (skip the sausage, add green chiles or cilantro, even refried beans). I like to make a full batch, cut the burritos in half, layer them in a plastic container, and stow them in the fridge. It's the ultimate fast food, easy to warm up for a quick meal or snack. In a large nonstick skillet over medium heat, cook the sausage. Once it is cooked through, remove the sausage from the pan with a slotted spoon and set it aside. If there's enough fat from the sausage to coat the bottom of the pan, add the chopped onion and pepper; if not, add enough oil to cover the bottom of the skillet, then add the vegetables. Cook just until soft, then add the cubed potatoes. Turn up the heat and fry for a couple of minutes, stirring often, until the edges of the vegetables are turning golden. Remove the vegetables from the pan and set them aside. Season the eggs with a big pinch of salt. Wipe out the skillet with a paper towel, then return it to the stove. Melt the butter in the skillet over medium-low heat, then add the eggs and scramble them. When they're almost done, turn off the heat and sprinkle the cheese over the top. Meanwhile, heat the tortillas in a hot cast-iron skillet or over an open flame, flipping frequently until warm. Divide the sausage, vegetables, and scrambled eggs with cheese among the four tortillas. Tuck in the edges of the tortillas and roll them up, burrito-style. Serve immediately, with or without salsa, or wrap up for later. To reheat, wrap the burritos in foil and heat for 15 to 20 minutes in a 350-degree oven. Alternatively, wrap an individual burrito in a paper towel and heat it in the microwave for 30 seconds.